With its firm texture and nutty flavor, black-eyed peas make a yummy side dish and a hearty addition to any soup or stew. But if you're like most people, especially if you're from the South, you may only enjoy these tiny legumes on New Year's Day for a little extra luck for the year to come. 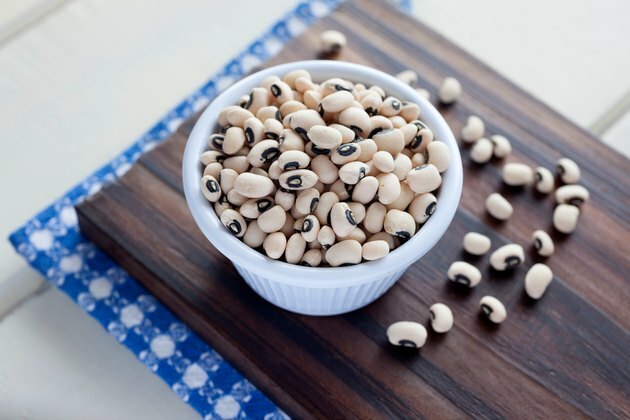 There's nothing wrong with starting your year off with some black-eyed peas, but including these black eyed beans in your diet more often may also benefit your health. When it comes to packing in nutrition, you really can't go wrong with beans, including the super nutrient-rich, black-eyed beans. These savory legumes are an excellent source of complex carbs, fiber and many essential vitamins and minerals. Beans like black-eyed peas are so full of good nutrition that they're considered both a protein food and a vegetable. The black-eyed peas nutrition of canned varieties may be a little different than when you prepare the beans yourself. Check the label of your favorite brand to compare the nutrition facts. Whether you prepare your black-eyed peas yourself or used a canned variety, you're packing in a powerful nutritional punch. However, it's important to point out that most canned beans contain a significant amount of sodium. One cup of canned black-eyed peas has 703 milligrams of sodium, or 29 percent of the DV, versus only 6.6 milligrams in the homemade version, which is equal to zero DV. Too much sodium in your diet increases your risk of developing high blood pressure and of having a stroke or heart attack. The American Heart Association says you should try to limit your daily intake of sodium to 1,500 milligrams a day. The canned version of black-eyed peas meets nearly half the recommended sodium amount. If you're short on time, canned beans are convenient, but for a healthier option look for low-sodium versions, which have about 240 milligrams of sodium per cup, or about 10 percent of the DV. Protein is an essential nutrient found in every cell, organ and tissue in your body. The recommended dietary allowance for protein is 46 grams a day for women and 56 grams a day for men. While most Americans get more than enough protein in their diet, it's usually from the same sources. For better health and nutrient intake, the Dietary Guidelines suggests that you vary your protein sources and include more nonmeat varieties. One of the major health benefits of black-eyed peas is that they serve as a nutrient-rich source of protein. However, like most other plant sources of protein, black-eyed peas protein is considered incomplete, which means it doesn't contain all of the essential amino acids. But as long as you eat a variety of nutrient-rich foods — whole grains, vegetables, nuts, seeds and lean meats — throughout the day, your body should get all the amino acids it needs to keep you in good health. Despite the myth, you don't need to combine incomplete proteins at the same meal to get the health benefits. The benefits of black-eyed peas are attributed to its soluble and insoluble fiber content, as well as its phytochemicals, proteins and peptides. Including legumes, like black eyed beans, in your diet may also help you manage your weigh, thanks to the fiber, protein and slow-digesting carbohydrates that help keep hunger pangs away. According to a 2015 article published in Clinical Diabetes, regular bean eaters were less likely to be obese than nonbean eaters. While canned beans are certainly convenient in a pinch, if you have the time, make your own black-eyed peas. It not only keeps you in control of your own nutrition, but also saves you money. First, you need to rinse and sort your beans, removing anything that doesn't look like it belongs. Then, place your dried black-eyed peas in a pot and pour in enough cold water to cover the beans with an extra 3 inches of water, cover the pot and soak for eight to 12 hours. After soaking, drain away the water and rinse your beans again. This is an important step if you want to avoid the uncomfortable gas that beans have a reputation for producing. Then, place your beans back into the pot and cover with fresh water, using 3 cups of fresh water for every 1 cup of dried beans. Place your pot on the stove and bring your beans to a boil, then lower the heat to a simmer and allow your beans to simmer for an hour. Voila, fresh beans without the sodium. Adding a bay leaf or cumin to your beans while they cook not only adds a little flavor, but may also improve digestion to help decrease embarrassing gas. The mild-flavored bean can add depth to your soup, stew or gumbo, or be used as a source of protein for your salad greens. You can also use your cooked black-eyed peas to make a bean salad. Toss your beans with chopped grape tomatoes, red onions, cucumbers, cilantro, olive oil and balsamic vinegar, with salt and pepper to taste. Or simply mix the beans with cooked brown rice for a nutrient-rich side dish for dinner. Of course, black-eyed peas also go great with greens.